Press Release – New York, NY – May 6, 2016 – Securities and corporate law firm Sichenzia Ross Friedman Ference LLP is pleased to announce that the Firm has represented Synergy Pharmaceuticals Inc. (NASDAQ: SGYP), a biopharmaceutical company focused on the development and commercialization of novel gastrointestinal (GI) therapies, on a registered direct offering of 29,948,334 shares of the Company’s common stock at a public offering price per share of $3.00 without an underwriter or placement agent. Synergy raised $89.8 million in gross proceeds. The Sichenzia Ross Friedman Ference LLP team was led by Partners Jeffrey J. Fessler and Stephen A. Cohen. 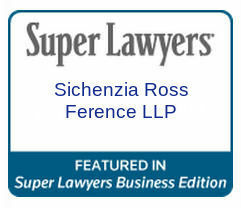 Sichenzia Ross Ference LLP is a nationally recognized securities and corporate law firm that provides experienced representation in all matters involving the securities industry. Super Lawyers consistently recognizes our attorneys as among the highest rated securities lawyers in the nation. Our attorneys specialize in advising clients on private placements, initial (IPOs) and secondary public offerings, alternative public offerings, preparation of SEC filings and listings on major capital stock exchanges such as the NYSE (New York Stock Exchange), NASDAQ and OTC markets. In addition, our litigation and arbitration attorneys are highly skilled in representing clients from routine lawsuits to complex cases before the SEC, FINRA and other tribunals. We also represent clients in a range of residential and commercial real estate and trusts and estates matters.